Another projected design for the RMA is dated from 1918. It shows a Giant Seaboat for transport missions. Compared to all designs of 1918 the Junkers Seaboat is really a Giant design. The wingspan of the flying boat was about 80 meters, the fuselage itself was 10 meters wide and the overall length of the boat was about 38 meters. The wing area was about 1000 square meters and therefore larger than the later Dornier Do X Flying Boat. 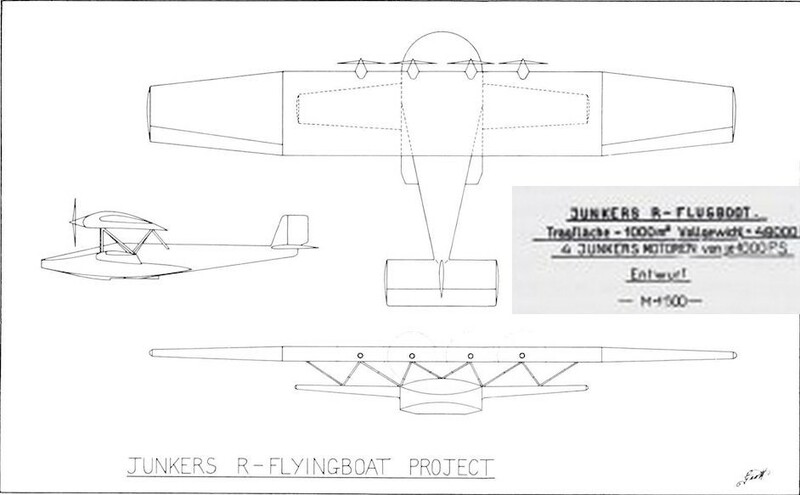 Junkers was thinking of four Junkers engines of 740kW each. During 1918 Junkers was developing the E Fo 2 engine at Magdeburg, which was capable to reach 370kW and which should be improved until 1919 up to 514 kW. Later the design seemed to be reduced. The wing area of the later design was about 530 square meters and the take off weight was reduced from 48 tons to 30 tons. The wingspan of this design was about 60 meters. However, the end of WW I also brought the sea boat developement to an end.